The fact of the matter is FTR law is flawed, and has over the years been “patched” to try and account for safety flaws; and as a result we have a very complicated law that is not well understood — particularly the exceptions. For a discussion of bicyclists should (for safety) ride see where-to-ride-on-the-road. Arizona’s FTR law is ARS §28-815A, and for comparison it is UVC §11-1205 [reproduced in full, at the bottom]. For comparison purposes: they are substantially the same, although the UVC also applies to mopedists, and also adds an odd exception about RTO lanes. Whenever the lane is too narrow to share. McKemy in City of Chandler. This is an unlaned local road in a residential neighborhood. As a practical matter, the only roads where FTR applies are likely to be roads where passing and overtaking are non-issues. These roads will mostly be un-laned, like the residential street pictured or sometimes local roads with clearly wide lanes (example). On roads like these, if a bicyclist is going less than normal speed of traffic, if faster traffic appears, the bicyclist is required to ride as far right as practicable. Practicability normally means something like no closer than 2 to 3 feet away, but varies depending on many factors including speed, sightlines (the bend in the road coupled with the wall obscures drivers’ views from the sidestreet), the many driveways are a backing hazard, etc. In any event the exact distance is rarely an issue because overtaking traffic would have no difficulty doing so. The preceding all assumes no other exception (debis, left turn, etc) exists. Being struck-from-behind in daylight on a road like this would be exceedingly rare, regardless of the cyclist’s position; in any event a collision could result in a valid FTR violation. Bicyclists and many other classes of slower road users (animal-drawn vehicles, animal riders, heavy trucks, mopeds, motor-driven cycles, Buses, Street sweepers and other road maintenance equipment, construction equipment and other vehicles used only ‘incidentally’, etc.) are all permitted to use these roads, despite their operating significantly below the posted maximum speed limit (in the example, the road is posted at 45mph Maximum); there is no minimum speed limit established here. The SDL [Slow driver law, §28-721B, UVC 11-301(b)] mentioned briefly above becomes important whenever any of the FTR exceptions exist. It would also function just fine for all road users in the event that FTR was repealed — as may bicyclist advocates recommend due to its continuous mis-application. The SDL in concept is nothing more than fast lane / slow lane. Faster drivers use the “fast lane”, the left part of the roadway available for their use, and slower driver use the “slow lane”, the right portion. The SDL is nearly identical to the FTR law, except it applies to all drivers. When the precondition is met “…proceeding at less than the normal speed of traffic”, any driver must drive either in the right lane (on streets with lanes) OR “as close as practicable to the right-hand curb or edge of the roadway”. Note well that a driver complies with SDL by doing one or the other, a driver need not do both; ‘or’ means or. The SDL has no effect on bicyclists whenever the FTR is not excepted (e.g. when riding on an unlaned road; or a road with wide lanes) because the duties FTR imposes on a bicyclist are either identical, or more stringent than SDL. As mentioned above, there are many types of slow traffic — traffic which sometimes or even always operate significantly below the posted maximum speed limit — both motorized and non-motorized that are both permitted and expected users of all roads; with the exception of limited-access highways. Once you, or whoever, become convinced a bicyclist isn’t violating the FTR law (or the SDL), invariably attention turns to impeding. The short answer is simply that AZ’s general impeding law, 28-704A doesn’t apply to non-motorists; The longer answer (which applies in 45 other states besides AZ) is published opinions by upper courts in two states find that drivers of vehicles operating at a reasonable speed for the vehicle they are operating are not in violation of the motorist impeding rule. The two cases in point were a tractor in Georgia, and a bicycle in Ohio. The full explanation is here. The special two-lane impeding rule, 28-704C, does apply to bicyclists, but only stipulates what to do when impeding, not that impeding in and of itself is a violation. The modern version of Arizona’s FTR was created in 1986 [sb1218-2nd-regular-session-1986 ], it was mentioned expressly in the floor notes it was to conform with UVC. For issues revolving around bike lanes see bike-lanes-are-preferential-use-lanes. Law enforcement should take care to understand, and cite the correct law (or not cite, as the case may be). There’s a common misconception that vehicles are only allowed one per lane; this is true most of time, because most lanes are only made wide enough for one vehicle, but the law about overtaking actually doesn’t say one per lane, it says “The driver of a vehicle overtaking another vehicle proceeding in the same direction shall pass to the left of the vehicle at a safe distance” §28-723. Motorcycles have a enviable, special, provision that prohibits other vehicles, except for another motorcycle, from ever sharing a lane, regardless of how wide the lane lane is, or how slow the motorcyclist is traveling. The same statute also has a not more than two-abreast rule, similar to that for bicycles. A. All motorcycles are entitled to the full use of a lane. A person shall not drive a motor vehicle in such a manner as to deprive any motorcycle of the full use of a lane. This subsection does not apply to motorcycles operated two abreast in a single lane. C. A person shall not operate a motorcycle between the lanes of traffic or between adjacent rows of vehicles. D. A person shall not operate a motorcycle more than two abreast in a single lane. photo: jonathan devich/epicimages.us Double-paceline in a narrow lane. 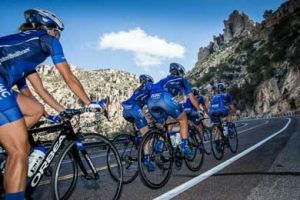 Here’s a great shot of the the UHC Womens Team on a training ride near Tucson demonstrating correct (safe) and legal lane positioning with a double paceline ascending Mt. Lemmon. (b) Any person operating a bicycle or a moped upon a one-way highway with two or more marked traffic lanes may ride as near the left—hand curb or edge of such roadway as practicable. 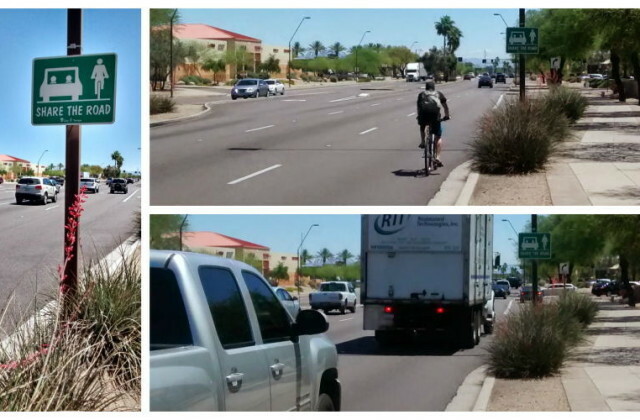 In AZ’s FTR narrow lane exception: ‘a’ and ‘the’ have very important distinctions. ‘The’ is the *definite* article, and ‘a’ is the *indefinite* article. ‘The vehicle’ would refer to some particular vehicle; which is not what the law says. Instead it refers to ‘a vehicle’ which would be any vehicle that might lawfully be upon the road. 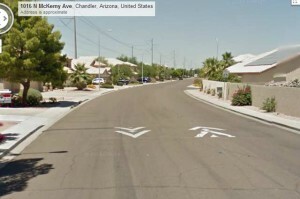 In Arizona, roads which are likely to engender FTR-type issues all allow maximum width vehicles (8.5 feet wide, not counting mirrors which can protrude making the overall vehicle width in excess of 10 feet). The case of fatality of William Easley in San Bernadino illustrates the confusions caused by FTR laws. The investigators assigned fault to Easley because he was riding abreast, the reasoning apparently being that since the rider to the right of Easly wasn’t struck, Easly must have been not riding far enough to the right. This all despite the driver’s failure to control speed — in other words the bicyclist was not swerving, he was lit (it was a night) and riding in a straight line. CA and AZ’s FTR law is similar with regard to the exceptions, and CA has NO prohibition on any riding abreast (AZ prohibits more than 2-abreast). The OH “Slow Driver Law” (SDL) in this regard are substantially different or changed from the UVC version. According to TLA (traffic laws annotated, 1979 is unfortunately the most recent year), OH was in “verbatim conformity… so someone mucked with it relatively recently. Significantly, the OH code uses ‘and’ where the UVC uses ‘or’. So, in ohio, the driver must do BOTH things listed there. UVC 11-301(b)	Upon all roadways any vehicle proceeding at less than the normal speed of traffic at the time and place and under the conditions then existing shall be driven in the right-hand lane then available for traffic, OR as close as practicable to the right-hand curb or edge of the roadway, except… The intent of this subsection is to facilitate the overtaking of slowly moving vehicles by faster moving vehicles.